This came to my attention the other day, and it shows just how deeply climate change hysteria has infected the business of government. For those not familiar with North Devon, it is in my view one of the most beautiful parts of the country, with some of the finest landscapes and seascapes. Much of it is wild and rugged, and in many ways unmatched in England. 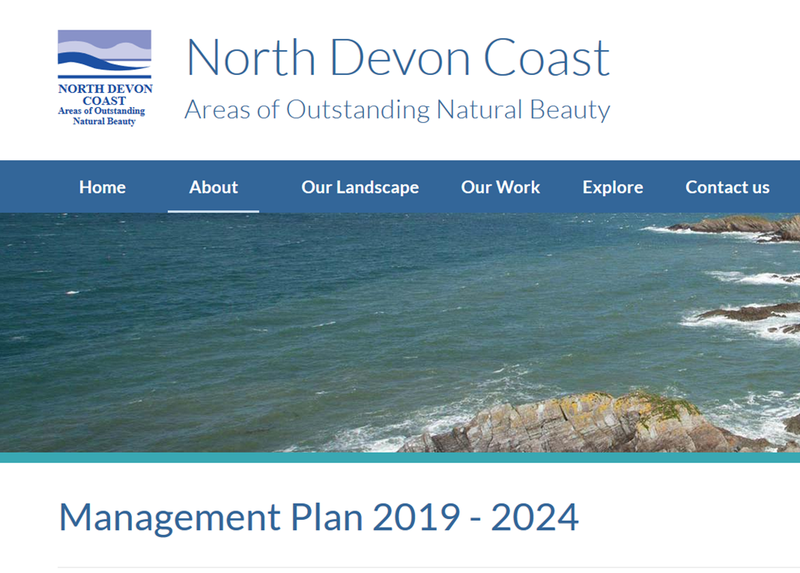 Quite rightly, the North Devon Coast has been designated as an Area of Outstanding Natural Beauty, and there is an obligation on the local authorities involved to prepare regular Management Plans, in order to conserve and enhance the natural beauty there. These plans involve all sorts of objectives and policies, such as landscapes, biodiversity, historical environment, infrastructure, farming, access and many others. Tucked away in the latest Consultation Draft, you probably won’t be surprised to learn, is a section called Environmental Quality and Climate Change. Apparently this is more important than the next paragraph, which goes on to talk about clean air, light pollution, clean bathing waters, and tranquillity, all things that any normal person would regard as of vital importance. But what about the claims for climate change – hotter and drier summers, warmer and wetter winters with more extreme weather and increased flood risk compounded by sea-level rise? 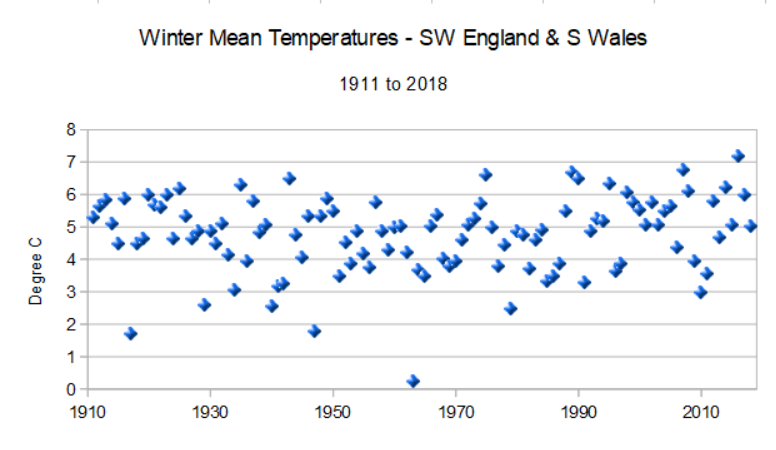 According to the long term Met Office data for the South West, winters are not getting wetter. 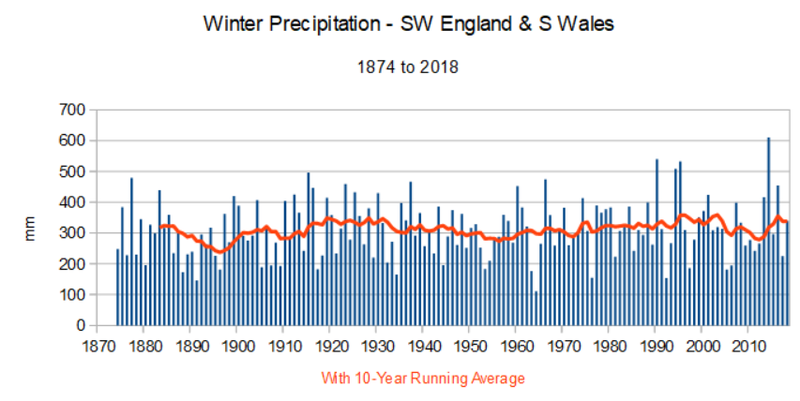 Apart from the record wet winter of 2013/14, there has been nothing out of the ordinary at all about winter rainfall in the last decade or so. 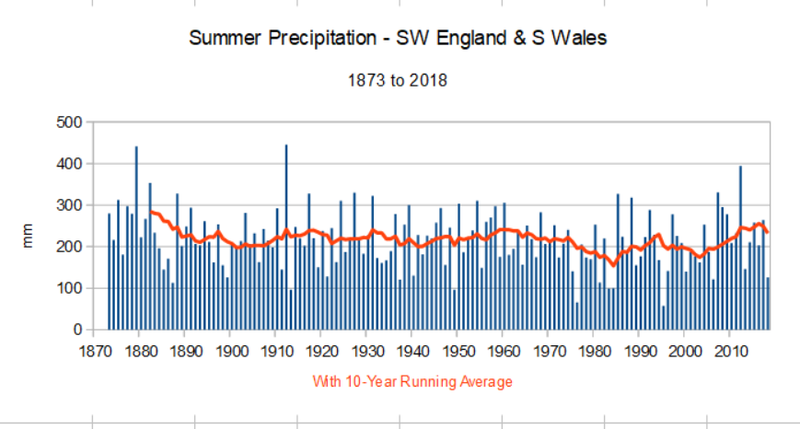 Equally, there is no evidence that summers are getting any drier. The Report makes no attempt to explain why a warmer climate should put any significant pressures on the environment of South West England . In any event, the actual data tells us a slightly different story. Apart from the winter of 2015/16, other recent winters have not been unprecedented. What stands out most is the relative absence of exceptionally cold winters lately. The Report talks about extreme weather, but as far as winter temperatures are concerned, winter weather was much more extreme in the past. 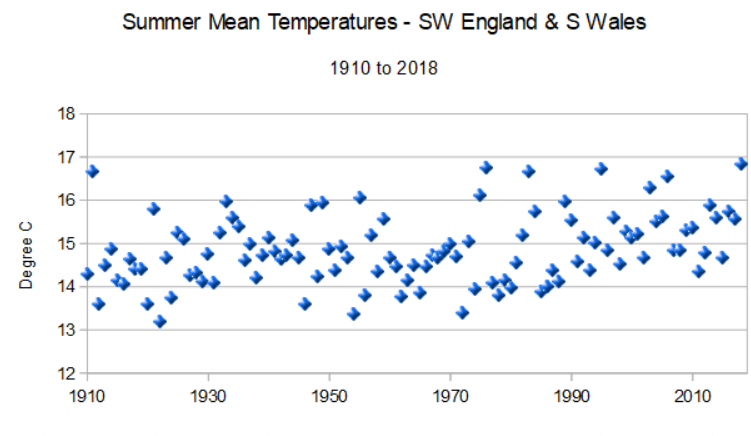 As for summers, it is apparent that we have frequently had summers in the past just as hot as recent ones. Even last summer was barely hotter than 1911. As with winters, there is an absence lately of dismally cold summers, surely much more damaging to the environment. Perhaps one of the best indicators of extreme rainfall is the monthly stats. While we do see flash floods from time to time, such as Lynmouth and Boscastle, the floods that really do the damage are the result of long accumulations of rain. The wettest month by far was November 1929, followed by December 1934. 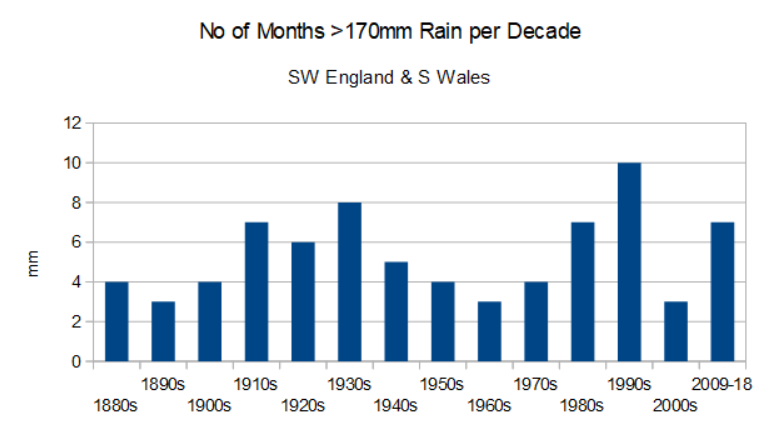 By contrast the wettest month in recent times was January 2014, yet this only ranks 4th wettest, behind October 1903. There have been seven months in the last ten years that appear on the chart, slightly above the average of 5.3. Historically however, that frequency is by no means unusual, and the 2001-10 period had the fewest months on record. Clearly there is no evidence here of increased flood risk. The reference to sea level rise is very much a red herring. The long term rate of rise is 1.81mm/yr, about half of which is the result of sinking land. The rate is not increasing either. Such a small rise will make no difference to the North Devon Coast. I cannot finish without a mention of wind farms. I find it incredible that Management Plan has virtually nothing to say about the impact on the environment of wind farms. I have searched the whole document, and only found two references to wind turbines, both of which are mentioned only in passing. Nowhere is there any suggestion that the wretched things be banned from the AONB, or even subject to local approval. Nor even a recognition of the damage to the environment already done. 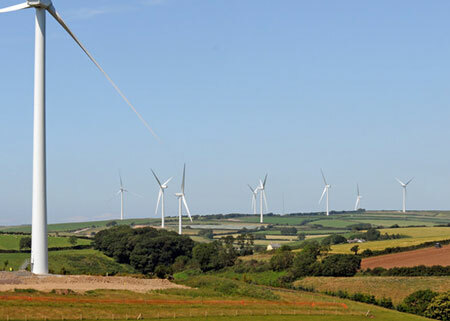 Yet wind farms, such as Fullabrook, between Barnstaple and Ilfracombe, have probably done more to ruin one of England’s finest landscapes than anything else in recent history. I agree Paul. I’ve holiday most years in North Devon/ Cornwall since the 80s. Every year I return I notice more windmills and black shiny fields of solar panels. How any ‘environmentalist’ can justify these eyesores and all the impact they have on wildlife is beyond me. And just wait until these massive “renewables” become dirty, less efficient, outmoded and need to be replaced. What will be done with them? Just add more next door, or on top of them? Talk about a future waste problem! Some are already leaving “eyesores” and toxic wastes…that like CO2 in amounts that cannot be “captured” and buried somewhere safely. The vast majority of Environmentalists live in cities and rarely venture out to places like Devon. They have no interest in the lives of local people in places like Devon and would be quite happy to see local economies in rural areas totally destroyed in the interests of meeting their agendas. Just listen to Caroline Lucas for as long as you can stand it. This is the drive of the popular revolution that is occurring all over the western world. My listening time to M/S Lucas can sometimes reach 10 seconds! Well said Paul. Facts trumping virtual signalling fantasy yet again! I’m sure they’ll be anxious to correct their latest management ‘climate crisis’ dogma in the light of you pointing out the bleeding bloody factually obvious, like there isn’t actually any climate crisis at all going on in North Devon? Or the rest of the UK or, er, the rest of the planet for that matter. Heard things were a bit sticky on Venus though. Must be our fault. North Devon Coast has a Köppen Cfb climate. It has not changed in over a hundred years. Talk of ‘climate change’ for it is ignorant. I have never been to the North Devon Coast. However, I will guess that it has been a Köppen Cfb with periods of slightly warmer and colder temperature at various times. The original idea of Köppen boundaries was based on vegetation. So the question I ask is how many years has the vegetation of North Devon been substantially as it is today. Discount, of course, those plants removed or added by the residents. Good catch. It would also be a good idea to look at soil profiles as they tell the history of an area. They take a long time to develop and so are more attuned to climate rather than weather. Although they get more Continental Weather from the South than Wales. We only very occassionally get Northern or Eastern weather. Coastal weather tends to be stable in the long term but very changeable from hour to hour or day to day. Thanks Paul, this is very useful information. The Fullabrook Wind Farm was given planning permission against the near-unanimous local opposition by a Government Planning Inspector, who said its impact on the landscape would be local and insignificant. It was the biggest wind farm in England when it was built. Upon construction its devastating impact on the landscape for miles around was immediately obvious to everybody. It has since been used by developers as an excuse to build more wind turbines nearby, on the grounds that as the landscape has already been severely trashed, building more wind turbines cannot make things much worse. The only people who support the trashing of the north Devon environment with wind turbines and solar farms is the local branch of the Green Party. PS. The photo you have of Fullabrook Wind Farm only shows nine of the 22 turbines as they tower above the coastline. The worst flood of all was the inundation of the Somerset Levels brought about by a plan to ‘re-wild’ that area by interfering with the drainage system. The flood had significant human effect but no one has put a figure on the numbers of ground dwelling creatures that would have been lost. I also think that there is an in-built balance between any suggestion of warmer weather and what must be a lower demand for fuel use. This is another case of knowing the price of everything and the cost of nothing. A recent BBC programme was quite forthright in suggesting that old people with large houses had an overlarge carbon footprint, intimating that they should sell-up for the general good. I suppose others with large footprints would be nursing mothers, the infirm and people who work from home. Was it not emblematic of the Climate Change puritanism that anything regarding emotion, anything regarding fruits of one’s labour, personal choice even, are now being dragged into a socialist context whereby the individual is nothing but a resource? How easy it is to make a general case that suits your argument out of hyperbole alone, supposition. The whole slant of modern societal thinking is the rise of the market place ranter. While the one that had a tangential pattern of thought is now banned the ones that support the local cadre of band-wagon conspiracy are allowed to emit all manner of pollutant thoughts without redress and the ones that not only support these myths of Mao-like unthinking but, additionally, dream up new proscription, find celebrity. This is an absolute rerun of the miserablist thinking that overtook the Commonwealth during the 17th century Civil War era. The environmental problem then was the devil, nonconformism that was threatening celebrity, as intoned by a priest with his name on the instrument that condemned Charles I. At his trial he coughed-up that about zealotry and the tide of fame attached to popular appeal did to people, “I became unknown even unto my self”, he might have been talking about phlogiston or Galileo’s refutation of the church’s order of the planets. Great impostures that had only the power of numbers and threat substantiating them. Things that when proven otherwise elicited no apology for the suffering they exacted in their moment. i spent some years in Devon and the north coast was a secret, Cornwall was too busy but the North Coast of Devon,Exmoor and into Zumersit………. everyone passed it by, reading about the whirlygigs etc, I’d best probably treasure the memories and not spoil ’em by going back to some auld haunts. On the rest of it, summers are warmer and winters colder – sometimes and that’s it, naturally. I wonder when people like the activist Caroline Lucas will begin to accept that there is nothing wrong with the climate and that there is nothing we can do to change it anyway. People like her are blind to the reality of a climate that has not changed for centuries and that all the dire prognostications which her ilk have made over the past 20 years have not come to fruition. I look forward to the time when government bodies and local authorities wake up to the realisation that nothing is changing and that we have nothing to fear in this wonderful world in which we live. But if Caroline Lucas and her followers live until she’s 100, she will still keep on spouting that the world is coming to an end next week, month or year, and we are all destined to doom and a terrible end. It is most unfortunate that just because people like her have managed to persuade an electorate to vote for her that they have a voice within and outside Parliament in excess of what she deserves; a voice that allows her unfounded scares to be broadcast. widely regardless of the scientific facts that disprove her statements on every occasion she makes them.. When you are being paid to worry about it, then you feign being worried about it. Lucas is not worried about the climate. To her and her tribe it is a means to an end. She – the Greens – are more left-wing than even Corbyn and his mob. She needs CC to justify her desire for a socialist society. Not for her, you understand, but for all the little people. Have I missed something? Surely the vigorous growth of wind turbines is strong evidence for climate change and global warming in n devon? Fortunately, the majority of the population are no longer taken-in by this pretend-science and it is believed only by the “manipulators”. Unfortunately, even the better science / engineering publications are now totally dominated by “manipulators”: the above extract was in The Engineer whose editors have recently followed the BBC and started censoring any correspondence critical of AGW or Remain, I’ve submitted my comments, but suspect that they will not appear! Yup – The IET went that way a long time ago (alot of a Vestas adverts in their mag so money may have had something to do with it). They produced a special edition of their mag for the 2009 Copenhagen COP – wish I’d kept it for posterity – cover-to-cover with absolute alarmist drivel and this from supposedly rational engineers (!?&!). Needless to say I resigned my membership and Chartered Engineer status in disgust. The IEE, which was ultimately gobbled up in the IET, had a much more rational approach. It published an excellent report on windmills when they started to become fashionable, highlighting their severe limitations. I too am rather sick of inferences by the IET that everything bad is caused by climate change (i.e what would be global warming if it happened). The latest comes from E&T Feb 2019 which asserts that wildfires are caused by a ‘warming planet’. Will someone tell these simple minds that correlation is not causation and that population is growing faster then temperature, and people are good at starting fires. You must have a high BS tolerance to still be a member. The E&T magazine was already riddled with alarmist nonsense 10 years ago when I quit. Their writers casually dismissed anyone sceptical of their alarmist narrative or critical of their policy presciptions as ‘deniers’ – including long time Chartered Engineers and Fellows of the Institution. And worse they would submit alarmist reports in response to government consultations – abusing the prestige of an Institution with hundreds of years of history dating back to Faraday – to advocate nonsensical and highly damaging energy policies. I can’t believe I paid hundreds of pounds in membership fees spent hours filling in a forms and attending interviews to become a member of that bunch of charlatans. here’s a portrait of a whole bunch of bird-whacker. . . er, I mean, wind farms. Hundreds of these things for about ten miles down I-65 in the US . . . northern Indiana. half of them are always idle when we come by during the daytime. Excellent challenge Paul – I’m sure others have already done so but here is my note to North Devon PLan contact. I have now reviewed the document and while I am not a resident of North Devon (I live in Somerset), I often visit North Devon to walk, fish and use the beaches, so I hope you consider my email worthy of consideration. This is an important document for the future of North Devon and such an important public policy document must be credible, supportable and testable against time and expert views. As such I hope you will review the attachment above and make the necessary changes especially regarding your claims of sea level rise, wetter winters and dryer summers. Pauls’ data clearly demonstrates your claims are inaccurate and as such undermine the credibility of your overarching objectives for North Devon and why the public purse should be supporting you. Does anyone give these b”””ers a hard time? For their crass irresponsibility? I grew up in north Devon and remember the frustration of many locals who were against this wind turbine development, in an AONB which was important for the tourism trade. They didn’t feel that their interests were heard, and now have to live with the results. In my view this was sheer vandalism on a vast scale. I can also draw your attention to the more recent development of seven wind turbines on the Rackenford moor, on the main A361 road into north Devon. When the A361 was first mooted, it was going to a dual carriageway road, but there was such an outcry for the local environmentalists and greens, who delayed the building, that the government of the day downgraded it. The main objection was over the section of new road across the Rackenford moors, which according to them would spoil the pristine natural beauty of the area. It is now so ironic that these new wind turbines on the moor were actively encouraged by the environmentalists, and in my view have a much larger visual impact than the road. National Government policy on wind farms wind farms and fields of solar cell energy collectors trump AONBs with the results all can now see. In North Devon maintaining AONB designation almost pointless. Should the County Council not be petitioned to have that AONB policy withdrawn? The damage has been done deliberately and the policy has failed to uphold the natural beauty. Call it a day and divert resources to something more productive……note to Devon County Council. Under Greg Clark MP, today’s Conservatives’ B.E.I.S. department is run by Claire Perry who is now Conservative Minister of State, was described by George Monbiot of the Guardian as a firebrand who wanted to nationalise the banks and overthrow capitalism”. Amazingly, she now presides over current Conservative UK Energy Policy and wields massive power to ruin the country economically through the foolishness of the 2008 Climate Change act and the grossly expanded use of expensive seemingly un-costed unreliable ‘renewable’ energy. All of us mere ‘peasants’ meanwhile, have to eek out our time ‘saving the planet’ while simultaneously in effect, having to apologise for living on it !